These beautiful pure squirrel hair chiqueter brushes are fixed with quills and fitted into long, flat, natural polished handles. Each brush is flat with two square-edged locks. 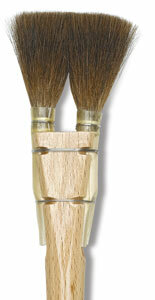 This brush is flat with two square edged round locks.